Elevate your instep (and every step) with a pair of our White Jacquard Premium Spats. 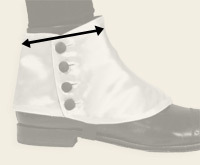 Perfect for weddings, society balls and other formal events, no one would ever guess the forerunner of these fancy spats were first designed to keep muck out of men’s shoes. They fitted well although it took some effort to button them. These spats were great. Nice quality. They looked great with the outfit. I would recommend them to anyone. Only spats I've ever owned. Wore them last night to much lauding. Nice quality. Absolutely a quality product; however, a little difficult to button up when the old body is not as limber as it once was. Always wanted a Newsboy cap,had one years ago in England and got lost in the passing of time.Now have a better one than before .Just right, fit is perfect look is great .W hats left to say ,well done chaps !!!! Wow! The faux leather ladies spats are beautiful, well made, and fit nicely. They arrived in a timely manner, packaged well, and communication was spot on. Thumbs up! Just w hat my husband wanted.